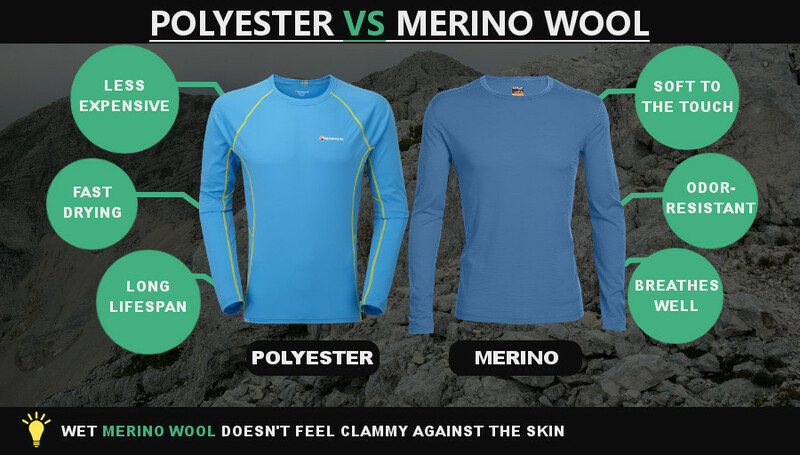 Home » Hiking Tips » Hiking Gear Materials » Polyester vs. Merino Wool: Which material is better for sportswear? Polyester is the most widely used material for sportswear. However, Merino wool is due to its multiple benefits also becoming increasingly used for sports apparel. Therefore, many outdoor enthusiasts and athletes are in doubt which material to choose. It’s indeed hard to say which one is better as both materials have advantages and disadvantages. For example Merino wool is a better option for hiking base layers as it is naturally antimicrobial (which is very useful for multi-day trips) while polyester is the material of choice for running base layers since such garments can be super light. In the following I will explain the advantages and disadvantages of both materials and give you advice on which material to choose based on the type of your activities. For those who are new to sportswear I will also explain which clothes are typically made of polyester and which of Merino wool. 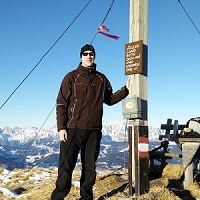 Note: I regularly use Merino clothing for hiking (see the Gear Tests section) and polyester clothing for running. This article is based on research as well as my own experience with the respective materials. Which clothes are made of Merino wool/polyester? Polyester and Merino wool are typically used for base layers, mid-layers, hats, gloves and socks. Polyester is occasionally also used for (super lightweight or low-end) pants. However, pants are typically made of nylon as nylon provides better abrasion resistance than polyester. Polyester and Merino wool are used for both summer and winter base layers. 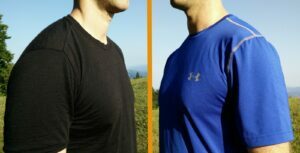 Many still think that Merino wool is only suitable for thick layers in cold weather but Merino wool can actually be knit into quite thin fabrics which are perfect for activities in warm weather (see the review of the Icebreaker Merino T-shirt which I tested on several hikes in very warm weather). Mid-layers are made of thicker knitted polyester or Merino fabrics than base layers. Polyester mid-layers are usually made of polyester fleece (fuzzy and soft fabric) which is very thermally efficient (it provides good warmth while being lightweight). Merino mid-layers are typically fairly heavy (thermally inefficient) and thus not the best option for athletes and adventurers. In most cases they weigh over 300 grams per square meter. Hats and gloves can also be made of both materials. Merino wool is typically used for relatively thin hats and gloves (liner gloves) while polyester (usually polyester fleece) is used for warmer gloves and hats. Socks are never made only of polyester or Merino wool fibers – they are always blended with other fibers (such as nylon and elastane) for increased durability and stretch. Nevertheless polyester or Merino wool fibers can account for up to 60% of the fibers in a pair of socks. Merino wool is very soft to the touch and typically doesn’t cause any itching. However, this also depends on the quality of Merino wool which is measured by the diameter of the fibers: The smaller the diameter, the softer the fabric. High quality Merino clothing is made of wool fibers less than 18.5 microns in diameter. Polyester clothing, on the other hand, feels synthetic to the touch as polyester is not a natural material (it’s made of plastic fibers, sometimes recycled bottles etc.). This is why some people avoid polyester t-shirts and refer to them as “melted plastic”. However, polyester is still the material of choice for sportswear which is not worn directly against the skin (due to its thermal efficiency) such as midlayers, but also for base layers in certain sports (like for example running – more about this below). In general Merino wool provides much better breathability than polyester – just try blowing air through both fabrics (of course of a similar thickness/density) and you will see that the polyester fabric “resist” much more than Merino fabric. However, there is one exception – valid for mid-layer garments where high-quality polyester fleece typically provides better breathability than heavy/thick Merino garments as it is more porous. Durability is the Achilles heel of Merino wool clothing. Therefore, I don’t recommend wearing Merino wool clothing for high-intensity activities such as running. Running exposes garments to severe abrasion (thighs/crouch area for underwear, armpit areas for shirts etc.) and Merino fabrics will sooner or later start tearing around exposed areas. To learn more about the durability of Merino wool check out our article How durable are Merino garments. Polyester provides much better durability than Merino wool and can last for ages. Polyester can be knit into thinner and lighter garments than Merino wool. The density of Merino wool fabric typically doesn’t go lower than 130g/m2 in order to minimize the durability issues (the thinner the fabric, the less durable it is). As polyester absorbs less moisture than Merino wool (0.4% compared to 33%), it doesn’t get as heavy when it’s soaked with sweat or precipitation and therefore it dries faster. However, keep in mind that due to the unique structure of Merino wool fibers, wet Merino clothing doesn’t feel as clammy against the skin as wet clothing made of other materials. Read more about this in our article Why should you wear quick-drying clothes for hiking. Merino wool is naturally antimicrobial and thus offers excellent odor-control. I’ve tested quite some Merino garments and no matter how long I’ve been wearing them they didn’t stink. Polyester, on the other hand, becomes smelly very fast. However, some polyester garments utilize anti-odor textile treatments (such as Polygiene) in order to stay fresh for longer. Nevertheless, these anti-odor treatments get washed out eventually – no antimicrobial treatment lasts forever. Therefore, polyester clothing is not the best option for lengthy activities such as multi-day hiking or backpacking trips. If you insist on wearing polyester clothing for lengthy activities such as multi-day hiking or backpacking trips, be sure to use treated polyester – but don’t expect that it will be efficient year in and year out. While polyester t-shirts usually cost around $20 (although usually more for those with anti-microbial treatments), Merino wool t-shirts typically don’t sell for less than $40. Merino wool clothing is in general much more expensive than polyester clothing. The price can rise additionally if a very high quality of Merino wool is utilized. Despite the common belief that Merino wool is warmer than polyester, that is not the case. The warmth of a garment depends very largely on the fabric density (thickness) and fit. Thick garments are obviously warmer than thin garments while tight fitting garments retain more body heat than loose one. Note that insulation should be mainly provided by the mid-layer clothing (fleece jacket, down jacket etc.) and not by base-layer clothing. Base layer clothing should be quick-drying and thus made of relatively thin fabrics. Polyester is more durable, less expensive and dries faster than Merino wool. Furthermore, polyester clothing is lighter than Merino clothing. However, Merino wool is more comfortable to the touch than polyester and provides better odor-control and breathability. Which material to choose is up to you but I do recommend Merino wool clothing for lengthy activities (backpacking, travelling and multi-day hiking/mountaineering) because of its great odor-control and comfort. For other short-term activities such as running and trekking I recommend polyester clothing because it’s cheaper and more durable. After such activities you can also easily wash your clothes in a washing machine and thus superb odor-control is not required.